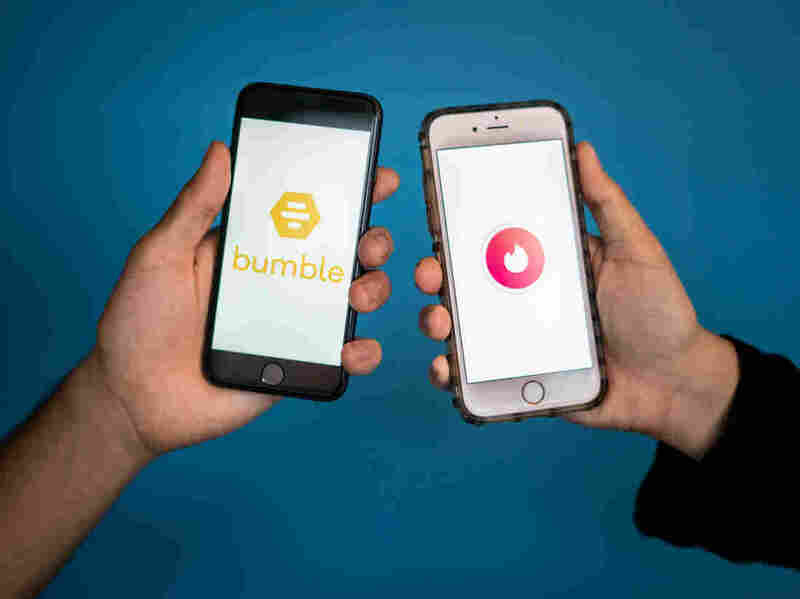 The Tinder-Bumble Feud: Dating Apps Fight Over Who Owns The Swipe The companies are battling over whether Bumble swiped Tinder's features. Their dispute sheds new light on how the patent system is grappling with invention on the Internet. In dueling lawsuits, Match, which owns Tinder, alleges that Bumble infringed on Tinder's intellectual property — while Bumble says that argument is bogus. The popular apps Tinder and Bumble have upended dating culture, all with a swipe. But Tinder's parent company says the similarities between the apps suggest another kind of swiping — of ideas. In dueling lawsuits, Match, which owns Tinder, alleges that Bumble stole Tinder's intellectual property. Bumble says those claims are bogus, designed to drive down Bumble's worth and "poison Bumble in the investment market," according to Bumble's lawsuit. The dispute between the two companies illustrates a recent shift in how the American legal system treats software patents. And, in general, it highlights the challenges of taking a patent system designed to protect inventors of machines ... and applying it to the Internet era. The two apps are indisputably similar — especially in their earlier versions. "You have a photo, a description, and then with a flick of a finger, you decide yes or no," says user David Luong. "[Bumble] was exactly like Tinder except women had to message first." He's been using Tinder since 2014 and hopped on Bumble as soon as he heard about it in 2015. He had high hopes for Bumble. Its users had more thoughtful profiles, he says. But in the years since, Tinder has led to more real-life dates, possibly because there are just more users. "I'm happy to use them both," he says. There's no love lost between the two matchmaking apps. Tinder came first. Bumble's launch sprang from a messy situation at Tinder headquarters. One of Tinder's early employees, Whitney Wolfe Herd, broke up with her boyfriend — who was also her boss and a co-founder of Tinder. She left the company and sued, alleging sexual harassment in a lawsuit that eventually settled. And she started Bumble. Match, the company that owns Tinder, then tried and failed to buy Bumble — twice. "We swipe left on you. We swipe left on your multiple attempts to buy us, copy us, and, now, to intimidate us. We'll never be yours. No matter the price tag, we'll never compromise our values. We swipe left on your attempted scare tactics, and on these endless games. We swipe left on your assumption that a baseless lawsuit would intimidate us." Match says its lawsuit is anything but baseless — detailing, in hundreds of pages of court documents, numerous similarities between the two apps. In the process, Match has accused Bumble of "almost every type of [intellectual property] infringement you could think of," says Sarah Burstein, a professor at the University of Oklahoma College of Law whose research focuses on design patents. One of the central questions revolves around Tinder's patented system for connecting people over the Internet. The matching is based on mutual interest, as expressed through a swiping motion. It's a real patent. But Bumble says it shouldn't be. Patents are supposed to cover inventions, not abstract ideas. Design a machine that does something, and you can patent it. Have an general idea, an overall concept? No patent. "You don't get a patent for saying 'cure dementia with a drug.' You have to say what the drug is," explains Daniel Nazer, a staff attorney at the Electronic Frontier Foundation. But in the Internet era, people discovered they could get a patent for an otherwise abstract idea as long as they tied it to an existing technology. For instance, you couldn't get a patent on "meal planning." But for a while, you could get a patent for meal planning on the Internet. Then, four years ago, the Supreme Court set new guidance for patenting software with a case called Alice Corp. v. CLS Bank International. The ruling, called the Alice decision, held that if you take an abstract idea and just propose using a computer or the Internet to make it happen, it's still an abstract idea — and still not patentable. So meal-planning on the Internet: No longer patentable. But what about Tinder's patent? Bumble argues the patent protects the idea of "matchmaking on the Internet," and should be thrown out. Tinder, meanwhile, argues that marrying the swipe motion with a matchmaking system is a true invention, a concrete improvement to dating app interfaces. Who's right? Burstein says in the post-Alice legal landscape, it's not an easy question to resolve. It's hard to have a simple test for what's an abstract idea, and what's a software invention. "You can't just say 'do it on a computer' and make it patentable ... That's not enough," she says. "You have to add something more. But that 'something more' is the difficult part." The dispute is still pending in court. Asked for comment on the lawsuits, both companies directed NPR toward their publicly available filings. Nazer, with the EFF, says a few months ago he'd have bet on a win for Bumble — but because the legal standards in this area are constantly evolving, today, he's not so sure. The Supreme Court decision has invalidated a lot of software patents, with courts finding that the patents never really extended beyond a general, abstract concept. That's a good thing, Nazer argues. His group, the EFF, believes overly broad patent protections were bad for competition, and that the Supreme Court's decision has fostered a healthier marketplace for ideas. It's also helped small businesses and start-ups protect themselves against patent trolls — people who get patents just to sue companies — and avoid expensive, drawn-out patent lawsuits, he says. Nazer argues that some ideas should be free to copy — like when Sears was one of the first retailers to start selling goods through a catalogue. If no one else had been allowed to follow suit, "would that have been good for the economy?" Nazer asks, rhetorically. Michael Risch, a professor at Villanova University's Charles Widger School of Law, has a few concerns. He agrees that many bad, overly broad patents have been thrown out under the Supreme Court decision called Alice. But good ones could be blocked too, he says. "Much of my work has been to illustrate that if you applied the definitions courts are using for abstractness, many of our most famous patents would wind up being unpatentable today. Like the telephone," Risch says. Alexander Graham Bell's patent was kind of broad, he says — you might argue he patented an idea for how to transmit sound over a distance. This push-and-pull, between allowing competition and rewarding true innovation, is at the heart of patent law, says Burstein, the law professor. "This is sort of the eternal question of patents," she says. "[The] tension we have between trying to get the rights not too broad, not too narrow, but ... just right." And whether the courts swipe right for Tinder or Bumble, the challenge of finding the right balance will continue.